The daily newspapers are always writing about how thieves are increasingly skilled in opening the doors to apartments, basements and garages. Faced with these increased skills, the defence strategy must be twofold. On the one hand, it is worth keeping one’s defence systems updated with the latest technological solutions, such as replacing the old double bit lock with new European security cylinders. On the other hand, however, it is also important to combine different technologies and solutions, such as mechanical and electronic, without entrusting the entire system to a single type of defence. Different solutions and technologies require different tools and skills in order to be attacked, and it is much more unlikely that a burglar possesses them all. A burglar who specialises in opening doors by brute force (still the most commonly used method) is unlikely to be equipped to overcome an electronic alarm. Conversely, a burglar who specialises in overcoming alarm systems may not be able to open a good security lock, which requires specific expertise and tools. The problem is that adopting different systems, such as a security door and an electronic alarm, results in higher costs and greater complications for the owner. For this reason it is not such a widespread solution as it should be. 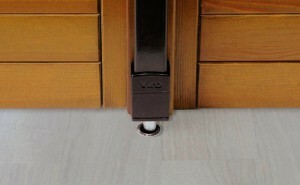 The new Viro Electronic Locking Bar can come in handy in such cases, precisely because it combines, in one easy to install product, both a mechanical and an electronic protection, thereby reducing the time, costs and complications which you would have when purchasing and installing two independent systems. But the benefits don’t stop there. 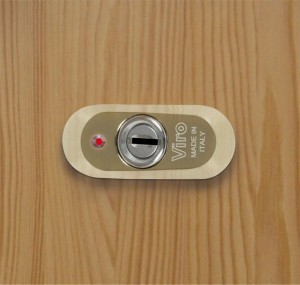 The Viro Electronic Locking Bar is also very easy to install, as it does not require any building works or electrical connections. The fact that it does not need mains electricity also allows it to be installed in places where electricity is not available, such as in the case of some basements and garages. The Viro Electronic Locking Bar can be installed on an existing door (main front door, up-and-over garage door, French window, etc. ), both horizontally and vertically. It consists of an armoured lock with 2 locking points with a built-in intrusion detection device which, when it detects an attempted break-in, uses a GSM phone dialler to send calls and alarm messages. An integrated room microphone checks, remotely by phone, what is happening in the room where the locking bar is installed, to understand whether it is a false alarm or a real burglary attempt. 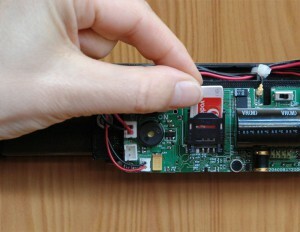 The SIM card enables the GSM network to be used to send alarm messages. Messages are sent to a list of numbers (up to 5), which is set by simply calling the SIM card number inserted in the locking bar from the mobile phones that you want to store. The batteries (supplied) are inexpensive and easy to replace: when they start to run out (on average after several months of use) the locking bar sends a warning message to the first number stored. The battery operation means that no wires or connections to the mains supply are needed, thus simplifying the installation and making it possible even in rooms where there is no electricity supply. 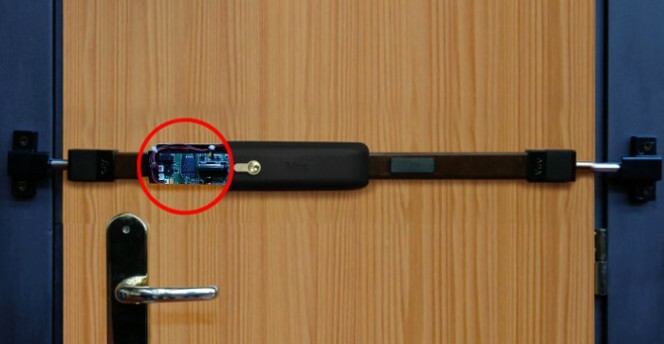 The locking bar has a vibration sensor which detects attempts to enter before the burglar enters the house and it sends an SMS alarm to the phone numbers previously stored. A call is also made to the first of these numbers. This is because, if you do not have the phone close to hand, you may not immediately notice that a text message has arrived, whilst a call with a longer ring is unlikely to go unnoticed. In any case, if the first call is not answered, another 2 calls are then started in succession When a call or answered, or after 3 attempts, the unit prepares to receive the call, and it can be called from any phone to listen to noises in the room and check whether it is a false alarm or a real break-in attempt. 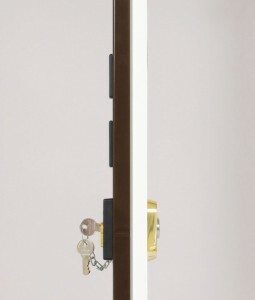 The system is activated automatically whenever the locking bar is closed and it returns to standby by simply opening the locking bar with the key. It adds 2 locking points, which withstand the unhinging and opening with a crowbar. Detail of one of the two closing points. Its 1.8 mm thick, U-shaped, painted steel structure withstands break-in attempts. 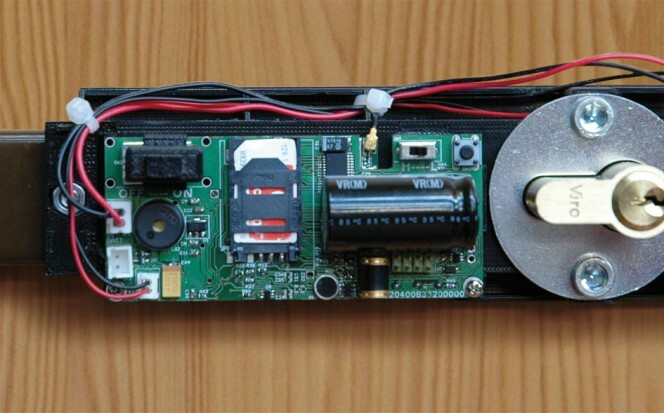 The body of the locking bar seen from above. 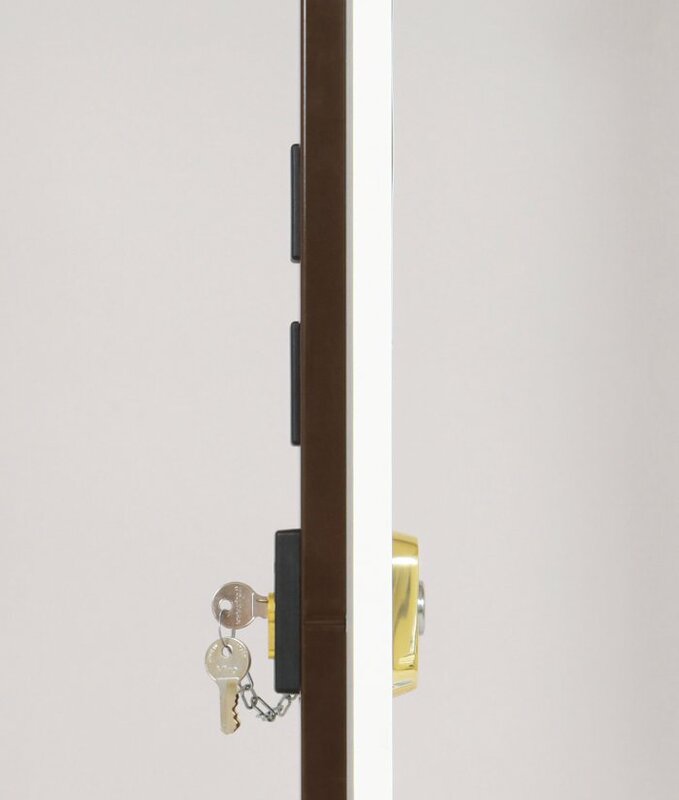 It adds an armoured lock with a security escutcheon to withstand pulling and drilling which multiplies the effort required to try to open the door by forcing or manipulating the lock. Detail of armoured lock seen from the outside with LED alarm activated. 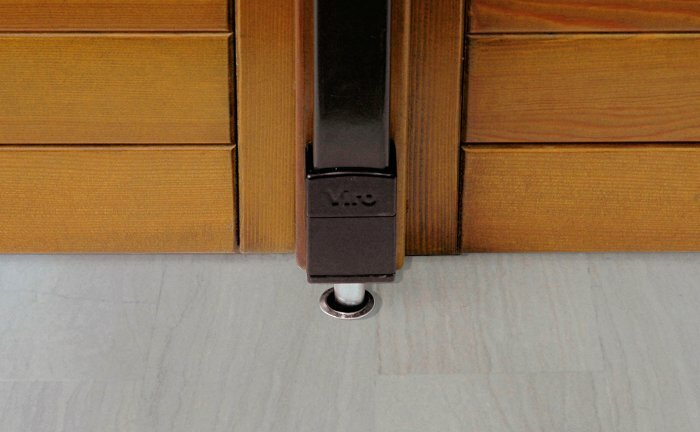 The new Viro Universal Electronic Locking Bar is therefore an effective, fast and cheap system to reinforce a main or secondary door or a door which separate from the main house, such as French doors, shutters, garage, cellar and basement doors, etc. The electronic alarm warns of burglary attempts in real-time. The mechanical protection prevents the entrance of thieves and gives time to intervene. The two combined systems are much more effective and much more difficult to overcome than the use just one of the two technologies. This entry was posted in Locks and Cylinders, No category and tagged home, main door, offices, products on 31 October 2013 by Mara Rossi. Hi, is this available in London? we have just sent your request to our Agent of the zone. Soon, you will receive a reply from him.